Antiwar.com's Justin Raimondo, that is. One would think that after eight years of Clinton "humanitarianism" and another eight years of Bushian "humble foreign policy" the American people would not be eager to elect another warmongering imperialist to the White Marble Throne. Not so. 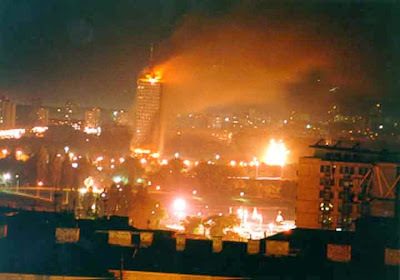 It was the Kosovo incursion that set the stage for the Iraq invasion, from the rhetoric of "liberation" to the mechanics of "nation-building." Operation Allied Force had all the elements that were later developed to the max in Operation Enduring Freedom – an allied group that provided phony "intelligence," i.e., war propaganda, and had the same hubristic, hectoring style. Militant interventionists, such as John McCain, jumped on board the war bandwagon because they realized that a precedent had to be set in the post-Cold War world, an assertion of American hegemony. Whether you want to or not, you are already funding murder and pillage at home and abroad, through taxes you are forced into paying. If you value your freedom and oppose the soul-sucking and murderous enterprise that is the Empire, I urge you to make a voluntary contribution to a cause of liberty and justice today. It's been four days since the election, and Serbia still doesn't have a government. Last time around, it took four months. Of course, last time it was hard to imagine that DSS would even think of an alliance with the Radicals (and now that's pretty much assumed), while anyone even thinking of a possible coalition between the DS and the Socialists would have been locked up in an insane asylum. Yet now you have the Imperial propaganda machine straining to promote the very people they've demonized for years as genocidal nationalist architects of Balkans bloodshed... It's actually kind of funny, if in a twisted way. Nikolić's election was protested by EU commissars. A scheduled delegation from Brussels canceled its visit. The world media (otherwise known for their fair and impartial coverage of Serbs, right?) are spreading panic about Nikolić being an ”ultra-nationalist” etc. President Tadić, head of the Democratic Party, said Nikolić's election was ”harmful to state interests” and a ”democratic Serbia.” Or was that a Democratic Serbia? Tadić's party has been negotiating (or not) for months with the old PM Koštunica about a new government, without results. They claim they got the most votes, so they can dictate the make-up of the government. One teeny little problem with that argument is that the Radicals actually got the most votes. But that's an inconvenient truth, and thus overlooked in "democratic" discussion. Because, you see, only the "democratic bloc" can act democratically and build democracy in a democratic state... At which point I'm getting flashbacks to an 1980s cartoon where every Smurf smurfs smurfingly the entire smurfing day! Plus ca change, plus c'est la meme chose, then. Seems like Tadić and his foreign sponsors believe they are the only ones that get to decide who and what is "democratic," regardless of how people vote or what they actually think. Holding people in contempt has never been a winning strategy in the long run. I wonder if they know that.